Dolan, a painter who worked in London in the second half of the 19th century, possessed a superb technique which he used to great effect, especially in watercolor. 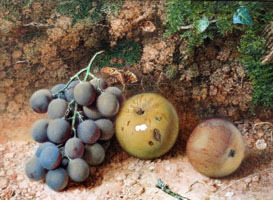 He was known for his still lifes of fruit and flowers, as well as for rustic genre scenes. He exhibited at the Royal Academy, Society of British Artists, Suffolk Street Gallery, and elsewhere. Listed:E. Bénézit, Dictionnaire Critique et Documentaire des Peintres, Sculpteurs, Dessinateurs et Graveurs, Gründ, Paris, 1999. Wood, Christopher, The Dictionary of Victorian Painters (Second Edition)Antique Collectors’ Club, Woodbridge (Suffolk), 1981.